For our third thirteenfridays picnic we headed to the picturesque seaside village of Llangrannog. Llangrannog is allegedly haunted by the ghost of a sailor known as Huw Puw who died in the 18th Century and is still said to wander the shoreline. We watched out for ghostly figures while enjoying our picnic beneath the cliffs near Carreg Bica. As a smaller party of two this week, we enjoyed a slightly smaller feast of 13. We were delighted to have a specially baked 13 ingredient loaf baked by Jack from the wonderful Bara Menyn bakery in Cardigan – (White flour, Spelt flour, Rye flour, Wholemeal flour, Natural wheat leaven, Water, Sea Salt, Oats, Seeds: Pumpkin, Sunflower, Poppy, Sesame, Linseed). With a 13 ingredient Caponata (Aubergine, Celery, Onion, Tomatoes, Capers, Olives, Garlic, Red Wine Vinegar, Oregano, Olive Oil, Salt, Pepper, Parsley), a 13 ingredient Hummus (Chickpeas, Tahini, Garlic, Olive Oil, Lemon Juice, Water, Salt, Pepper, Sumac & four seed mix topping: Sunflower, Sesame, Pumpkin, Golden Linseed, Sumac). A green leaf salad garnished with 13 wild garlic mustard leaves and 13 vine tomatoes. 13 falafel made with 13 ingredients (Chickpeas, Spring Onions, Garlic, Ground Cumin, Ground Coriander, Fresh Coriander Leaves, Flat Parsley, Nutmeg, Black Papper, Salt, Baking Powder, Sesame Seeds, Sunflower Oil) and 13 Pistachio and lime squares also with 13 ingredients (Plain Flour, Caster Sugar, Butter, Salt, Ground Pistachio Nuts, Eggs, Soft Brown Sugar, Lime Zest, Lime Juice, Sunflower Seeds, Pumpkin Seeds, Oats, Baking Powder). As we finished our picnic and began to pack away the beach started to fill with children from the nearby Eisteddfod Urdd campsite site. There are stories from other children who have stayed on the Urdd site of a black nun who transforms into a crow and torments the campers! We made our way through the hordes and up onto the cliff path to take in the view and look for for the spectral figure of Huw.. This week we headed out in brilliant sunshine on the hottest day of the year so far. Feeling a little heady with the vitamin D and finally in shirt sleeves after the long long cold of the Welsh winter we were in high spirits as we loaded the car and set off for Aberystwyth. As we joined the coast road ready for our first glimpse of the sea sparkling in the sunshine we were a little disquieted to find it instead covered in a low sea fog. We continued our journey joking as we went that Aberystwyth was probably enveloped under a cloud. As we progressed north, we saw a strange, grey wall of fog looming ahead of us. We dipped in and out of the fog with glimpses of sunshine in between until we neared Aberystwyth and – hey presto – it was indeed enveloped in sea fog made truly eerie by the sunshine filtering through the layers of mist. 1. The Promenade Couple – A young woman has been seen leaning towards the sea from the promenade railings; a young man runs towards her but both are floating a foot above the ground. They both then run towards one another, embrace and then turn towards Constitution Hill running hand in hand along the promenade. The couple then glide down the steps to the beach and head straight into the sea eventually disappearing under the water. They are said to be the spirits of a young couple who were tragically killed in the 1960’s after becoming trapped by the high tide at the end of the promenade under Constitution Hill. 3. The Ghost of Alexandra Hall – a ghostly face is seen at the windows of the ex-University Halls of Residence and there have been numerous stories of ghostly encounters by resident students. Behind the building is the derelict Boar’s Head pub which is also said to be haunted by the ghost of an ex-landlord who hanged himself, inconsolable after the tragic loss of his fiance. Our feast included 13 cheese scones, 13 mini feta & spinach pasties, 13 slices of Bara Menyn bread with a 13 ingredient Suma Mushroom pâté – Water, Palm Oil, Yeast, Mushrooms, Potato flour, Onion, Corn starch, Salt, Garlic, Paprika, Clove, Nutmeg & Thyme. A Glebelands salad garnished with 13 primrose flowers & 13 Pennywort leaves; a 13 ingredient potato salad – Pink fur apple potatoes, Carrots, Red Onion, Hazelnuts, Olive Oil, White wine vinegar, Salt, Pepper, Sugar, Seeds – Sunflower, Pumpkin, Sesame, Golden Linseed. 13 ingredient Rocky Road made by Kirsty – Milk Chocolate, Dark Chocolate, Golden Syrup, Butter, Digestive biscuits, Raisins, Cranberries, Orange Juice, Nuts – Pecan, Brazil, Hazel, Almond and Cashew; 13 ingredient Flapjack – made by Sam. In the evening we went along to Ceredigion Museum for the ‘Aber Shorts’ event showing a series of short films in the Coliseum Theatre space. A piece from our 2011 Arts Council of Wales funded project in Aberystwyth had been selected to be screened. Stuart Evans, Display Designer at the museum told us about a strange experience he had whilst introducing a film in the theatre in which we were now sitting. We headed off home in the twilight and as we came along the coast road to the headland past Llanon we pulled into the lay by to witness the surreal sight of the late evening light playing over the fog which hugged the surface of the sea; an extraordinary experience. We started off with a thirteenfridays road trip armed with sound recording equipment, digital cameras and an original Polaroid camera – to take an unfakeable and unique Polaroid image at each location. We followed Pembrokeshire Beyond’s haunted map of Pembrokeshire with seven locations to visit. Our first stop was St Thomas‘ church in Haverfordwest, which is now out of use, (an apparent 40% chance of a paranormal encounter…) where we unpacked the first part of our 13 themed picnic in the graveyard. Located in the centre of town, there are reported sightings of hooded figures making their way to the old priory situated by the river below the hill and the notorious Owl Man who leaps from trees to assail unsuspecting walkers! We had the first part of our picnic feast of 13 in the churchyard, with 13 cucumber and cheese sandwiches; 13 samosa, 13 cherry tomatoes on the vine, a selection of 13 teas and 13 peanut butter cookies..
With the sun shining and the wildflowers in bloom all around us it was hard to imagine our supernatural fellows at this location, but with the strange growth patterns of the trees – one looking like a giant man-sized nest – it would be quite another prospect after dark. Most of the reported activity is on the road itself so we didn’t stop for any 13 picnic snacks – it is a very atmospheric area though. We stopped for a wander around the ruins at Haroldston seeking a glimpse of the white/grey lady and made a sound recording there which we will take a little time to process and draw out any EVP in the recording. In Broadhaven (only 30%…), ‘…the epicenter of a UFO and alien activity epidemic from 1977 to 1982.’ we keenly watched the skies for signs of activity and sat at a picnic table near the beach for our second picnic break. With a bottle of Hop House 13 lager to drink we served 13 veggie sausage rolls, a tortilla made with 13 ingredients (potato, sweet potato, squash, beetroot, parsnip, celery, fennel, onion, cheese, eggs, butter, black olives and oregano), and a 13 ingredient lentil pate (red lentils, water, garlic, ginger, tomato puree, oats, cumin, coriander, bay leaf, tumeric, chili, sumac and salt) served with 13 mini oatcakes. Our next stop was at Newgale (50%…), where ‘A man is said to run across the road into the path of unsuspecting motorists. he has been described as young with fair hair while others have described him as wearing a red jacket’. So on to our final destination on a small road from Llys y Fran to Clarbeston (just 10%…but wow…) where ‘A flaming coffin is said to travel through the road and over the hedgerow. The object was said to have knocked a man off his bicycle and gave him a terrible scare while another man walking thought the object was on collision to kill him.’. No flaming coffins encountered we’re disappointed to report. Stopping at the reservoir to enjoy the last part of our picnic – 13 chocolate chip cookies and a warming cup of one of our 13 tea selection. Looking at the Polaroids and processing the photos and audio clips from the day we found a couple of unusual results…one polaroid might show an interesting anomaly and something happened to the metadata on photos taken around Broadhaven and Newgale…IMG_7226 from Newgale is out of place and the ‘date modified’ suggests it was modified before it was taken! We’ll be exhibiting the original Polaroids, sound works and other outcomes from our 13 weeks of supernatural picnicking later in the year. This year has two Friday 13ths and like 2013 (when we started the thirteenfridays project) there are 13 weeks in between! In celebration we are planning a new series of events. The series kicks off on Friday 13th April with a road trip suggested by the Pembrokeshire Beyond website. Equipped with Polaroid camera, audio & video recorders, an open mind and a picnic feast of 13 we aim to visit all of the seven spooky sites around Pembrokeshire, stopping for a snack and a search for paranormal activity at each location (some are haunted roads so might not be possible to stop). Each Friday will then take us out to different haunted locations with different 13 themed picnics, to explore sites and stories of strange and supernatural goings on around Wales. Friday 13th October 2017 is the centenary of ‘The Miracle of the Sun‘ in Fatima, Portugal. We took this as a sign to create a Portuguese style thirteenfridays meal with an added sun theme. 13 Spooky Sardines – Simple and tasty with 13 lemon slices. We served both starter and main course with a 13 ingredient salad of rocket, spinach, watercress, celery, fennel, cherry tomatoes, sun dried tomatoes, sprouts, sunflower seeds, pumpkin seeds, capers, red pepper, and olives along with a side dish of 13 cornichons and more green olives. Paranormal Punahou – A 13 ingredient Portuguese Bean stew (modified to be vegetarian) – red kidney beans, white kidney beans, stock, onion, carrots, potatoes, chopped tomatoes, macaroni, pasata, savoy cabbage, garlic, water and seasoning. Served with 13 Batatas a Portuguesa (Portuguese fried potato). 13 Petrifying Pastéis de Nata (Portuguese Custard Tarts) – A must have Portuguese dessert! Evil Espresso Thirtinis & Scary Sunflower Seed Brittle – a little extra dessert to celebrate the sun theme! The first Friday 13th of 2017 and we decided to combine three celebrations into one to celebrate in fine thirteenfridays style. We started the evening by setting up a radio experiment to commemorate the first public radio broadcast made on January 13th 1910 and at the same time pay homage to Jacob’s Grandad Bernard Jones, born on January 13th 1914, an inventor and pythagorean, interested in using technology to communicate with the other side. Bernard was one of the inspirations for setting up the Absent but not Forgotten project back in 2010, so we wanted to send him birthday greetings across the great divide. Bernard was interested in EVP (electronic voice phenomenon) so we set up a detuned radio to play white noise into a Latitude 150 walkie-talkie (446.00625-446.04375 MHz)) while a Sennheiser EW100 wireless microphone kit (830-866MHz) picked up the noise at the other end of the walkie-talkie and sent the noise to a reciever where an Ipad webcast live to youtube. Bernard would undoubtedly have enjoyed the new technologies we could bring to the experiment. Using 2 radio frequency transmitters and receivers potentially increases the chances of paranormal communication…the experiment ran while we dined in the adjacent room, the result is below. The intermittant transmission is the result of the frighteningly poor upload speeds in rural west Wales rather than any spooky goings-on we fear! During our thirteenfridays meal we listened to the opera Cavalleria Rusticana which is cited as the first public radio broadcast in 1910 and included this song by Enrico Caruso. Not natural consumers of opera we were feeling quite high brow, but it must be said that not all our guests appreciated the cultural adjustment (you know who you are…). Hen Galan is the Welsh New Year or the old new year as it was before the calendar change of 1752. Still observed in the Gwaun Valley not far away, our thirteenfridays menu took a Welsh turn in celebration. Worrying Welsh Rarebit – 13 slices of local Bara Menyn 5 seed bread topped with classic Welsh rarebit made with Welsh cheddar and served with a foraged garnish of 13 pennywort leaves and 13 wild sorrel leaves. Pastai Bysgod Peryglus – Welsh fish pie made with 13 ingredients – Cod, Smoked Salmon, Mussels, Potatoes, Leeks, Fish Stock, Parsley, Bayleaf, Dill, Flour, Butter, Egg, Pepper. Served with 13 New Potatoes, 13 Purple sprouting Broccoli and 13 Kalettes. 13 Twisted Welsh Cakes – 13 crushed cardamom pods and dried cranberries providing the twist on the classic. “Bernard was an engineer, worked for Renold Chains as a Precision Chain Inspector until 1963 when he left to go into business opening the electrical shop VAX in Claremont Road. 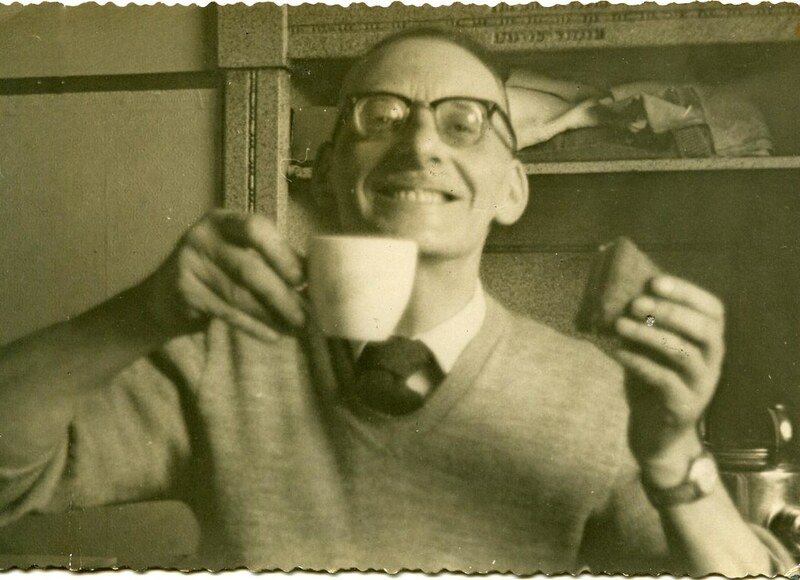 He had always invented things – horlicks mixer, hanging scales, designograph (the prototype idea that led to the spirograph), and once he had the shop he invented the Invertest, the electrical safety testing device that won him an award in the early 1970’s from the Inventor’s Society (Manchester ?) 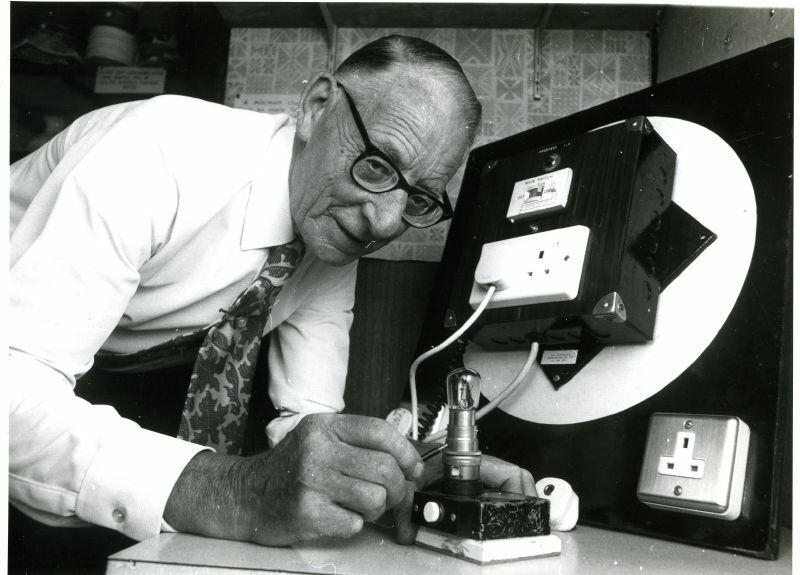 who had a regular stand annually at the Ideal Home exhibition where he showed his inventions every year. Watch a documentary about ‘Bernard and the Phone.’ made for the first Absent but not Forgotten exhibition in 2010. Aspects of the exhibition are loosely based on some of my Grandfather’s research into EVP. As an electrical engineer and inventor he was convinced he could make a telephone that would communicate with ‘the other side’. Oddly enough, he, like me, had a barn full of semi-working and broken Hifi and TV – interesting that we both share a fascination with what might be found in the broken, silent or noisy portions of recorded media. Jacob Whittaker. The interview was processed and edited to include the audio waveform and a sequence of images derived from frequency analyses of the silences within the audio. …Im sure the technologies available now would have interested and excited his ‘Giant Brain’ “.